He’s been upsetting conservatives for weeks—and now he is upsetting liberals, too. 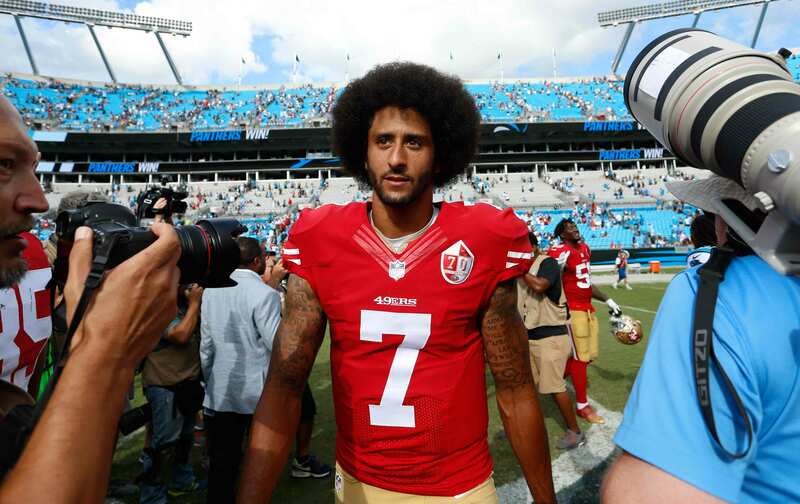 San Francisco 49ers quarterback Colin Kaepernick is on a mission to make this country face the reality of racist police violence, one anthem protest at a time. That is his quest. His mission is not to make sure that Hillary Clinton becomes president. It’s not to keep the liberals who have supported his “right to protest” happy. He is representing a politics that falls outside the conventional cable-news discourse. Kaepernick is using his new platform to reject the partisan framework that passes for politics. It is bracing, it is brave, and—again—it is upsetting many of the right people. The implication, despite hundreds of years of evidence to the contrary, is that “real change” happens only when you cozy up uncritically to one of the two major parties. That would be news to the masses of protesting people whose fingerprints exist on every piece of progressive legislation ever passed. To Kaepernick’s credit, it’s not like he is holding a press conference to give his “hot take” on the debates, like some kind of wannabe pundit. He was asked in the locker room for his thoughts. He could easily have deflected or even said, “I’m focused on this police-violence issue.” Instead, he spoke his truth. If you think that the number-one issue in the fight against racism in this country right now is stopping Donald Trump, then argue that point. The worst thing Hillary’s supporters could do is call him “shrill” or an “idiot,” because he represents the very demographic that Democrats need to turn out in November to secure the White House. The only people being “shrill”—a word I hate as a writer, because it has such sexist connotations—are Bill Maher and USA Today. Colin Kaepernick has the right to his opinion on the flag and he has the right to his opinion about the elections. Instead of blasting him, maybe people should try to understand why someone would look at this country, look at the cases of Terence Crutcher, Terrence Sterling, Alton Sterling, Keith Lamont Scott, and so many other human beings who have become hashtags, and try to understand why the solutions on that debate stage would taste like the thinnest possible gruel—utterly unsatisfying to young people whose appetite in 2016 is for bold change and some semblance of justice.